As far as truly authentic Italian experiences go, it’s tough to match ripping around Lake Como from behind the wheel of a brand new Fiat 500 Abarth. Of course, some of you may believe otherwise; some of you may even have your own ideas of how best to pursue la dolce vita. But eat all the pizza you want, sample the fruits of Tuscany until giddiness sets in, serenade a loved one from underneath a balcony in Verona, and visit so many Florentine galleries that you need to visit a Florentine cobbler immediately thereafter—none of these activities will draw an admiring glance from an Italian. Trust me. However, if you happen to be spotted driving the highest-performing version of one of the most beloved cars in the country, you will be amazed at the response from Italians of all ages. They will meet your gaze, they will smile, and they will nod in tacit approval. What is going on here? Good question. After all, this car is not a Ferrari. It’s not even a Lamborghini, Maserati, or Alfa Romeo—it’s just a simple compact car with humble beginnings in Turin. Those beginnings extend all the way back to 1936 with the original Fiat 500, known as the Topolino. 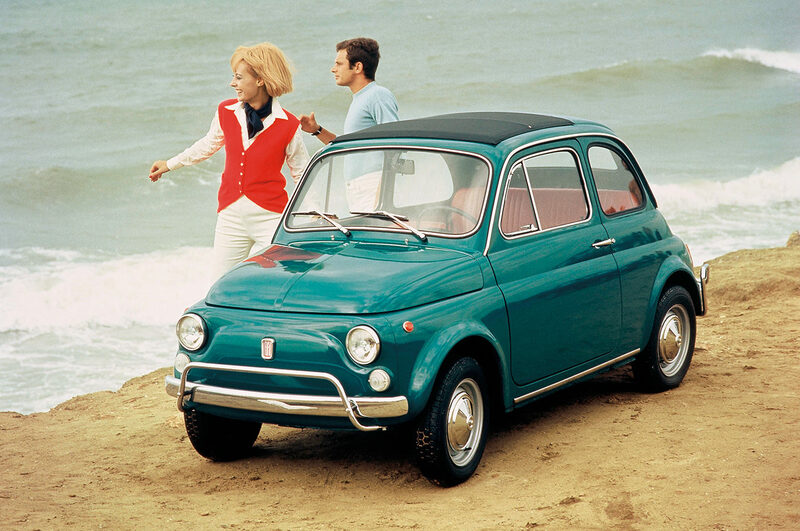 A reinterpretation followed in 1957 called the Nuova 500 and code-named the Cinquecento. areas from Paris to Tokyo. The formula used for the Nuova 500 was a familiar one; in fact, in post–Second World War Europe, each of the continent’s major industrialized nations produced their own take on the basic commuter car. In France, it was the Citroën 2CV, a quirky, bubble-shaped vehicle that was offered from 1948 to 1990. In England, the pocket-sized Mini arrived in 1959 and made an immediate impact with the British motoring public. Of course, by the time the Fiat appeared on the scene, the world had already become familiar with the concept of the commuter car; the original “people’s car”, the Volkswagen Beetle, can be traced back to Germany in 1933, when several designs first appeared. (There was no actual production until 1945 as a result of the Second World War.) The Beetle not only signalled the dawn of a new class of car, it also became a symbol of nationalistic pride and a decidedly non-violent way to exhibit the country’s industrial might. Roberto Giolito put pen to paper and came up with a Fiat 500 that is, unquestionably, a proper homage to Dante Giacosa’s original design. Although there were differences between these four cars from various standpoints, both aesthetic and mechanical, they all carried the mantle for their respective nations in a workmanlike manner. In the 1950s, Europeans needed cheap and efficient modes of transportation—and these cars certainly filled the bill. But they also boasted no small amount of style, and they all gained celebrity status with the in-crowd, becoming a fashion accessory for movie stars, musicians, and politicians. Much like a true fashion house offering, the two-door Nuova 500 begat many variations, including soft-top versions and wagons, along with cars with racing stripes, racier interiors, and larger engines. The more patriotic Fiat owners even adorned their little coupes with Italian flags on the side-view mirrors. Fast forward some 40 years and everything old suddenly became new again. The Volkswagen Beetle resurfaced as the New Beetle, a modern take on the classic. Armed with a new silhouette—one that nevertheless bore a distinct resemblance to the original—it also boasted improvements in terms of comfort, convenience, safety, and reliability. What the New Beetle in 1998 confirmed is that there are markets to be conquered by tugging on the heartstrings of car buyers; in other words, there were sales to be tallied by going retrospective. Three years later, the new Mini appeared, thrust back into the spotlight by new owners, BMW, and the sales success was repeated. If anything, the new Mini line proved what is possible when retro style and modern substance are given equal consideration right from the start. Although purists bemoan the fact that the new version slightly dwarfs the original in all key dimensions, the Mini is very much the pacesetter in the premium subcompact segment when it comes to driving dynamics. The New Beetle and the Mini not only helped start the trend toward retro cars, they also brought them upmarket; the originals were very much basic transportation, the modern interpretations come with more cachet and bigger price tags. The success of the New Beetle and the new Mini definitely paved the way for the modern day 500. So Fiat designer Roberto Giolito put pen to paper and came up with a striking little car that clearly evokes the iconic Nuova 500. Of course, there are differences, (as with the New Beetle and the new Mini, this 500 is longer and heavier than its predecessor), but these concessions make sense when you consider today’s far more stringent safety standards, and the simple fact that the average person is larger now than in the 1950s. Other decisions designed to make the current 500 more appealing included moving the engine to the front of the car and changing the configuration from rear-wheel drive to front-wheel drive. Despite these fairly significant alterations, the design of the current 500 is unquestionably a proper homage to Dante Giacosa’s original design. 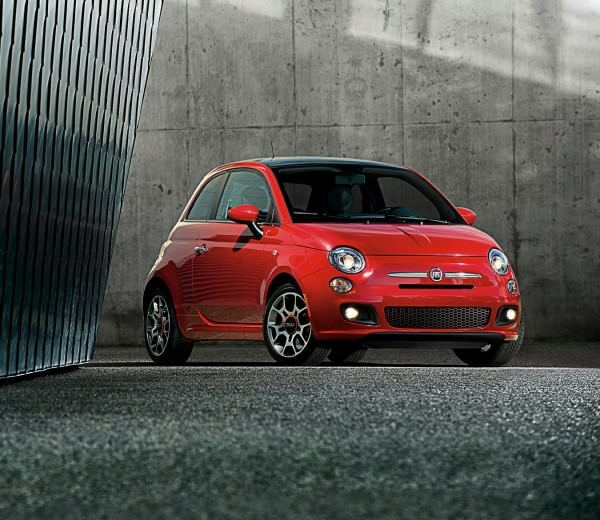 The 2012 Fiat 500 Sport. For all the modernization that has taken place, the Fiat remains a very small car. The back seat is roomy enough for children—or adults with inherent bendiness—so the car should perhaps be classified as a 2+2 rather than a true 4-seater. But due to its pleasingly round shape, headroom for front-seat passengers is decent, and the visibility forward and to the sides is very good. The hatchback’s cargo area is also tiny at only 185 litres, but the back seats fold down to create enough space for a big run to the grocery store. In Europe and other markets, there are any number of versions of this new Fiat 500 available; the 500 Abarth is one of the racier models. This pocket rocket is powered by a 1.4-litre turbocharged four-cylinder that produces 135 horsepower and 133 pound-feet of torque, respectable numbers for a car weighing less than 1,000 kilograms. With the sport mode engaged, torque jumps to 152 pound-feet and the car produces enough punch to generate some honest grins. The top speed for the car is rated at 205 kilometres an hour—decent for a city car if somewhat unspectacular compared to some other Italian cars. But it’s also worth noting that fuel consumption for the Fiat is just 6.5 litres per 100 kilometres during combined driving, so it gives away nothing to the likes of Ferrari in this respect. As befits a modern compact car with a decidedly premium sheen, the Fiat comes equipped with the kind of technology that people could not even imagine when the original first appeared, including ABS with electronic brake force distribution, hydraulic brake assist, and a torque transfer control system that reduces front-wheel spin under acceleration. By and large, the driving experience is fantastic. Although the steering on the Fiat may be a bit imprecise, the shifter on the five-speed manual is somewhat slack, and the turning circle disconcertingly large, all of this matters little because the 500 is simply a blast to drive. The interior environment also brings added fun to the experience. The 500 Abarth has a cabin that includes sport seats, aluminum pedals with rubber inserts, a chunky steering wheel, a leather-covered shifter, and a handbrake lever. The gauge set is impressive, too, with an analog turbo pressure dial—the icing on what is a very tasty cake. All told, there are reportedly 549,000 possible configurations for the new 500—including 11 different paint colours, seven different interior trim choices, and 100 separate accessories—although only time will tell just how many of these personalization options will be available in North America. Yes, that’s correct: the 2012 Fiat 500 has arrived on our shores. The Italian icon, on par with Sophia Loren, pasta, and the Vespa, will be seen in cities all over the continent. There is some debate about how popular the car will be—despite gas prices and vehicle emissions, North Americans still love big vehicles—but my time with the Fiat 500 Abarth proved one thing: there will never be too many fun, fuel-efficient, compact cars in this world. In fact, they’re needed more than ever. Roll on, little Fiat.